Being part of a large family has its advantages. That’s even more true in the boatbuilding world where, unlike with real families, the idiosyncrasies get smoothed out over time. 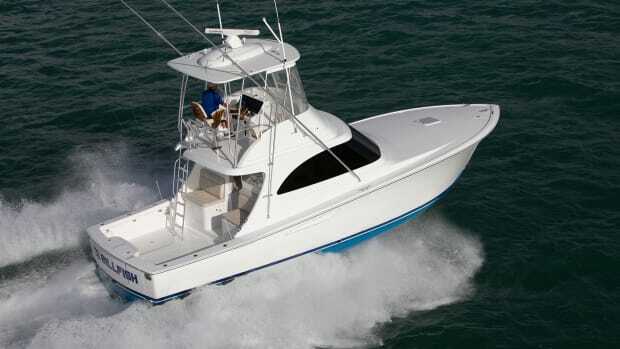 Lessons trickle down through new processes, designs and materials, so that even the youngest member of a family of boats benefits from changes at the top. 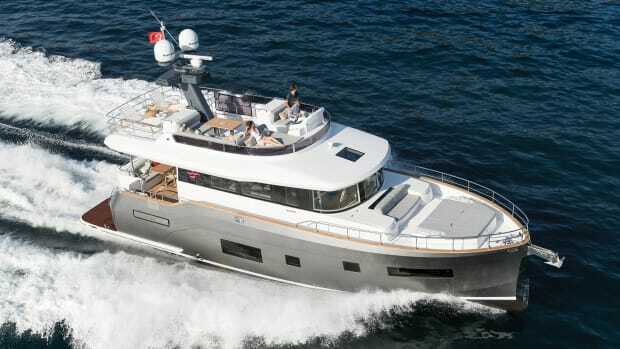 That technology transfer is particularly evident on Viking’s new 44C. I had a chance to spend some time aboard Hull No. 1 at Galati Yacht Sales on Anna Maria Island, Florida. Beyond the new interior design and traditional straight-shaft Volvos, the 44-footer feels like a larger convertible. 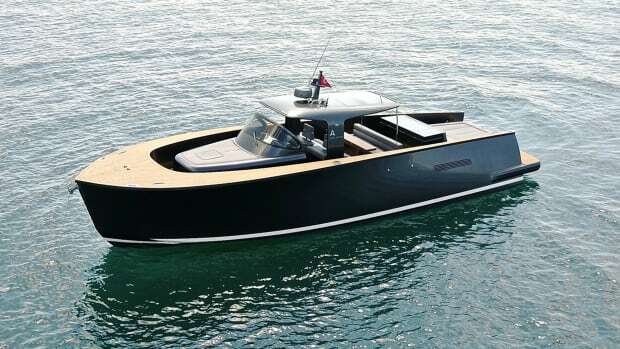 Galati specced the boat with lots of options, including upgraded 1,000-hp Volvo engines (standard diesels are twin 800-hp MAN i6-800CRMs), and a few dozen other niceties, ranging from the carbon-fiber-finished electronics box above the helm to the upgraded sofa in the salon. 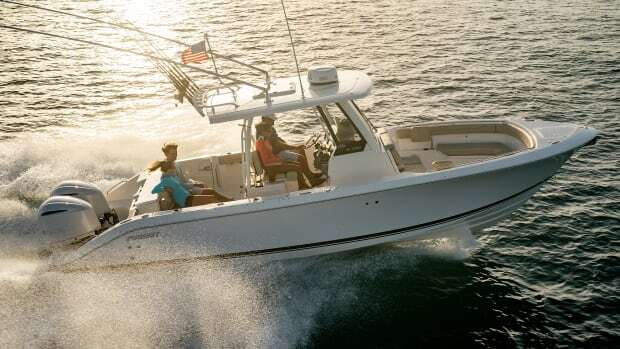 The boat, like most convertibles these days, is designed for both fishing and cruising. 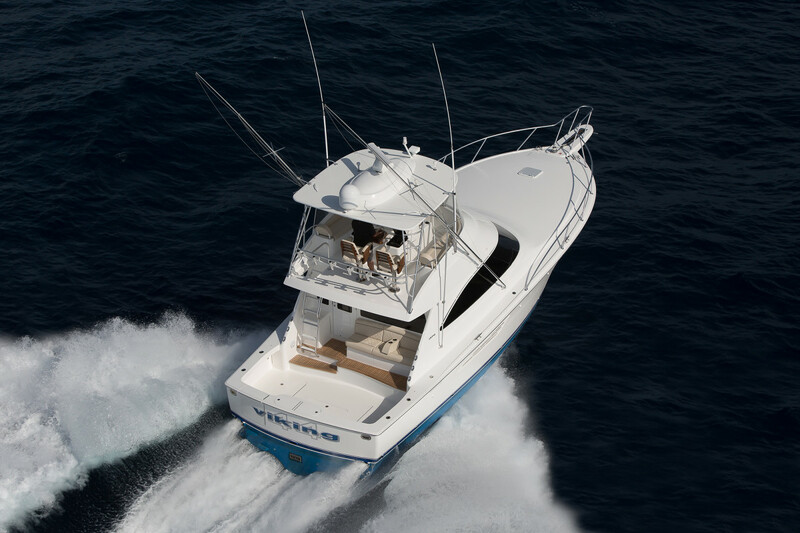 The 44C comes standard with a refrigerated cockpit step box, large in-sole fishbox and transom livewell. 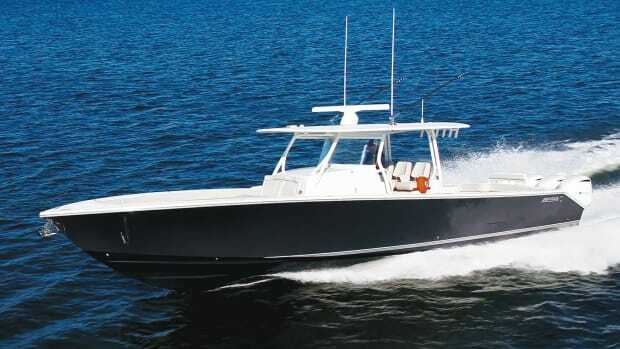 Galati added Rupp outriggers, pre-wiring for electric teaser reels, a thermostat-controlled drink box, six rod holders and engineering space in the center of the cockpit for the Seakeeper 6. 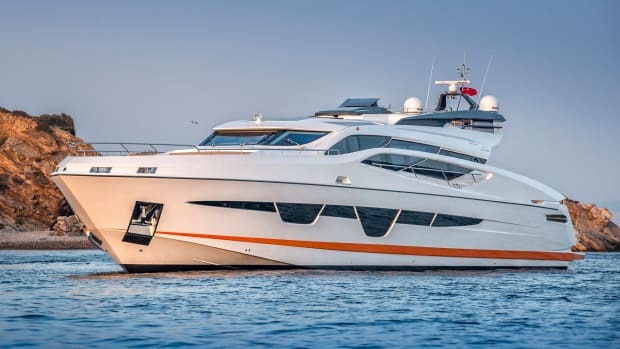 Inside, the galley-down configuration makes the interior feel like a larger yacht. Ditto having the main stateroom amidships, rather than in the bow. Up front, wide bunks crisscross each other in the bow stateroom, maximizing usable space. Fit and finish is yacht-grade, especially the teak joinery, which is built by the same Viking craftsmen who do the 92. 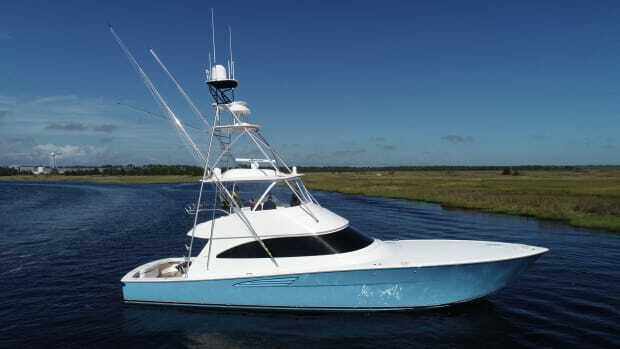 They do the interiors at Viking’s New Gretna, New Jersey, facilities, and install them at the nearby Mullica plant, where the 44C and 44 Open are built. The flybridge is where the owner and guests will hang out while running. 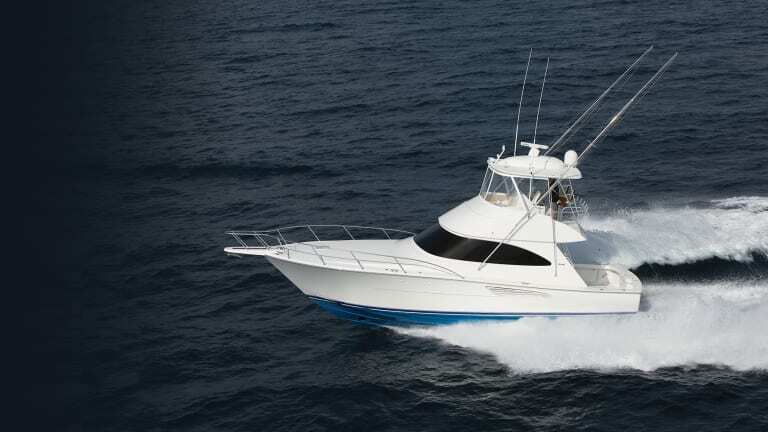 Its forward walkaround area and excellent sightlines from the helm once again feel larger than a typical 44. 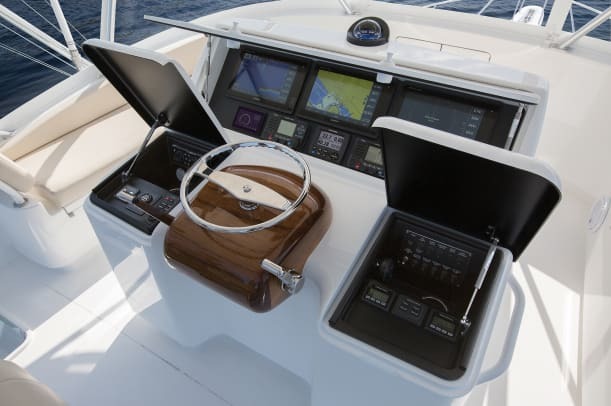 Garmin’s glass cockpit was installed by Viking’s sister company Atlantic Marine Electronics, while the railings and tower structure were from another affiliate, Palm Beach Towers. One of the coolest options is the drop-down electronics box positioned on the hardtop; it opens with the push of a button. 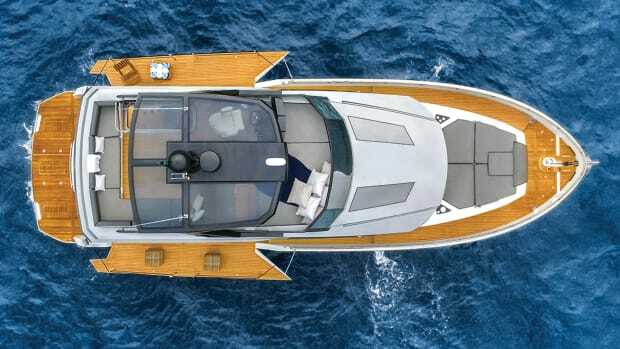 The slender Palm Beach-style throttles are set in an island of varnished teak and they have small buttons along the tops to control the Sidewinder thrusters. 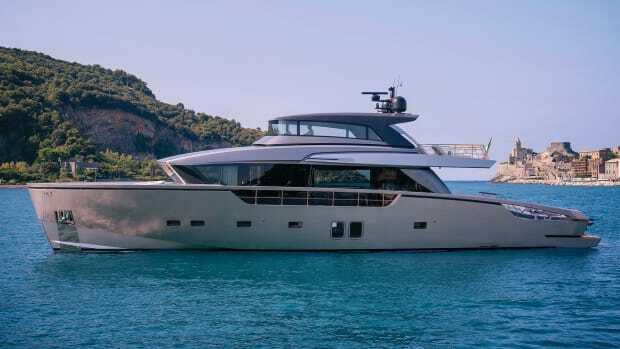 Viking went for the minimalist look to help define the exterior of its newest family member.